Writing about acupressure the past couple of weeks got me curious about acupoints – pressure points on the body where therapeutic results can be realized through the application of appropriate amounts of pressure. 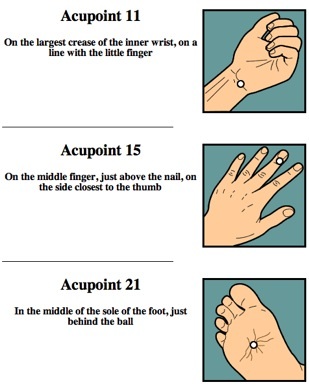 Basically, acupoints are the points on the body where acupressure (or acupuncture) should be performed. When searching for information about acupoints, I came across this informative guide the PointFinder guide, which offers a handy tool to help you find acupoints on the body, providing pictures of the pressure points’ locations, ways to apply acupressure to these points and the symptoms or ailments these acupoints can help relieve (use the “Find Acupoints” pull-down menu on the PointFinder guide). Acupoint #21, located near the center of the sole of the foot and pictured above, is a pressure point that can help relieve stress and pain in the foot, and in the whole body. Check out the guide for yourself, or provide us with links to your own. Let us know a favorite point and what reactions your massage recipients have to certain acupoints! This entry was posted in Health & Wellness, Massage, Pain Management, Stress Reduction and tagged acupoint, acupressure, health, Massage, massage therapy, pain, pressure points, stress. Bookmark the permalink.